Sampurna Chattarji (1970, Dessie, Ethiopia) is a poet, novelist, translator and children’s author who writes in English. Her fourteen books include five poetry books — Space Gulliver: Chronicles of an Alien (HarperCollins, 2015), The Scorpion (e-book, Harper21, 2013), Absent Muses (Poetrywala, 2010), The Fried Frog and other Funny Freaky Foodie Feisty Poems (Scholastic, 2009) and Sight May Strike You Blind (Sahitya Akademi, 2007, reprint 2008). Her two novels, Rupture (2009) and Land of the Well (2012), are both from HarperCollins. Numerous anthology appearances include 60 Indian Poets (Penguin); The Bloodaxe Book of Contemporary Indian Poets; The HarperCollins Book of English Poetry; Both Sides of the Sky (National Book Trust), We Speak in Changing Languages (Sahitya Akademi); Interior Decoration: poems by 54 women from 10 languages (Women Unlimited); and The Literary Review Indian Poetry Issue (New Jersey: Fairleigh Dickinson University). She edited the anthology Sweeping the Front Yard (SPARROW 2010), a collection of poetry and prose by women writing in English, Malayalam, Telugu and Urdu. Her poetry has been translated into German, Swiss-German, Welsh, Scots, French, Gaelic, Estonian, Arabic, Portuguese, Frisian, Maltese, Slovenian, Galician, Tamil, Manipuri, Kannada, Marathi, Gujarati, Bangla and Bambaiyya; and her children’s fiction into Welsh and Icelandic. Sampurna was the 2012 Charles Wallace Writer-in-Residence from India at the University of Kent, Canterbury. Dirty Love (Penguin, 2013), is her collection of short stories about Bombay/Mumbai; and Selected Poems (Harper Perennial, 2014) is her translation of the Bengali poet Joy Goswami, which was shortlisted for the inaugural Khushwant Singh Memorial Prize for Poetry. She is Poetry Editor for the print magazine The Indian Quarterly. 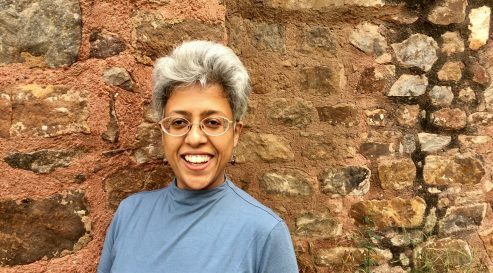 Sampurna Chattarji participated in a number of projects organised by Literature Across Frontiers, including Poetry Connections India-Wales a project marking the 70th anniversary of independent India. You can find more about her work and writing on her official website.